The concept of reusing water in Silicon Valley is not new. There are more than 150 miles (240km) of purple pipes – the designated color for pipes carrying recycled water. Some cities have incentives to encourage water reuse in homes and an “advanced water purification center” in San Jose is able to treat wastewater to drinking water standards – yet the region still has an incredible amount of untapped potential. California’s drought, now in its fifth year, has highlighted the need to conserve water and increase efficiency. And slowly gaining more attention is the idea to match water quality to water need. More than half the water supply for Silicon Valley is imported, originating in the Sierra Nevada mountains. “Does it all need to be the cleanest, safest drinking supply known to mankind or can some of it actually not be that clean?” asks Josiah Cain, a landscape architect at Sherwood Design Engineers. The answer is actually that we don’t always need pristine drinking water to meet a lot of our water supply requirements. We certainly don’t need it to flush our toilets. For a typical office building, 95 percent of the water used could come from nonpotable sources, says Worthen. This means that almost all the water used in an office building goes to irrigation, heating and cooling systems, and to flushing toilets and urinals. In a multiunit residential building, the number is 50 percent – much lower, but still significant. Arid California will undoubtedly face future droughts and climate change modeling indicates that these may be longer and more severe, and that the timing and amount of crucial snowpack will change, affecting the availability of water when it’s needed most in hot summer months. All of which means that finding new ways to augment water supply is becoming a priority that extends beyond the current water crunch. In a 2014 report, the Pacific Institute, a global water think tank, found that California had significant potential to increase water reuse and capture stormwater. “Traditional supply options are tapped out,” the report found, adding that groundwater is overdrafted in many places and there are few options for creating new surface storage reservoirs. Reuse creates a water supply that is both reliable and local. “It can also provide economic and environmental benefits by reducing energy use, diversions from rivers and streams, and pollution from wastewater discharges,” the report found. Beyond what’s already being done there is another 1.2 million to 1.8 million acre-feet (1.4 to 2.2 billion cubic meters) per year potential to expand water reuse in the state, especially in coastal areas, the Pacific Institute reported. And in the San Francisco Bay Area and Southern California cities, capturing stormwater could reduce flooding and boost water supplies by 420,000 to 630,000 acre-feet or more annually. For comparison, an average California home uses 0.5–1 acre-foot a year. And there are other reasons, too. Researchers from UCLA found that there are health benefitsfrom using recycled water because it supports the maintenance of green spaces, can decrease air pollution and can lower greenhouse gas emissions. Silicon Valley has gotten a jump on water reuse, but still has a long way to go before it’s widespread at either the home, business or municipal level. Alan Hackler, founder of Bay Maples landscaping company, got a good sense in the last year of how popular water reuse is becoming. Hackler’s team installed 16 graywater systems and five rainwater catchment systems in homes in 2015 and held numerous workshops to teach the principles to others. The easiest and most popular way to reuse water at home is for “laundry-to-landscape” systems, for which there is now a state code. These involve piping washing machine water to gardens for irrigation. Hackler also does graywater projects that use bathroom sink and shower water for irrigation, too. Some cities, like Palo Alto, are helping to spur more water reuse in the home. Palo Alto’s building code requires new construction or large renovation projects to make homes laundry-to-landscape ready. Hackler has also found that the process isn’t always consistent from city to city – or the costs. A building department permit in one city may be $600 and in another it’s only $200. Not surprisingly, the biggest impact from recycled water currently comes from water reuse at the municipal level. And the biggest player in this is the South Bay Water Recycling program in San Jose, which provides nonpotable water via 143 miles (230km) of “purple pipes” to the City of Santa Clara, the City of Milpitas and two water retailers – San Jose Water Company and San Jose Municipal Water System. Each day about 10 million gallons (40,000 cubic meters) of recycled water are piped from this system to 800 irrigation and industrial customers including Levi’s Stadium, Great America, McCarthy Ranch Shopping Center, Guadalupe Gardens, Intel and San Jose City Hall. The water is used in cooling towers and power plants, for toilet flushing in dual-plumbed buildings and for irrigating golf courses, street medians, college campuses, parks and other landscaping. Some of the water in the system is currently mixed with highly treated recycled water from theSilicon Valley Advanced Water Purification Center. It treats wastewater to drinking water standards, but the water so far is only permitted to be used for nonpotable purposes, although in the future it may be used to replenish groundwater. 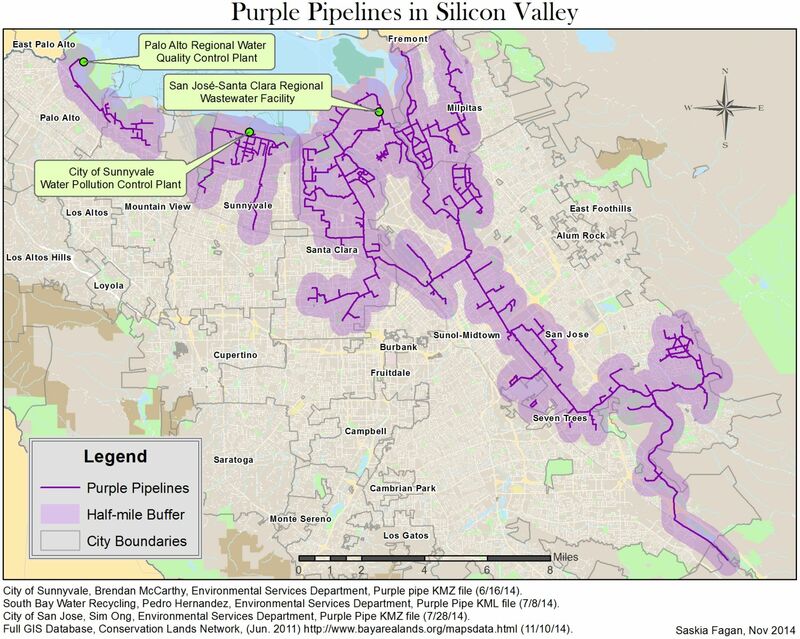 Besides San Jose’s treatment plant, there are three others – in Gilroy/Morgan Hill, Sunnyvale and Palo Alto – that produce recycled water for purple pipe systems. Palo Alto’s biggest customer is next door in Mountain View’s north of Bayshore neighborhood, home to Google and other businesses. San Mateo County has some municipal water recycling, although not as much as Santa Clara County. Daly City’s North San Mateo County Sanitation District has been providing 1 million gallons (4,000 cubic meters) of recycled water per day to irrigate areas of Daly City as well as irrigating Harding Park and Fleming Park golf courses in San Francisco. And nearby, the Pacifica Recycled Water Project irrigates the Sharp Park Golf Course and other areas in Pacifica. Across Silicon Valley, interest in recycled water is high, says Bobel. “The drought has really increased everybody’s interest, that’s for sure,” he said. 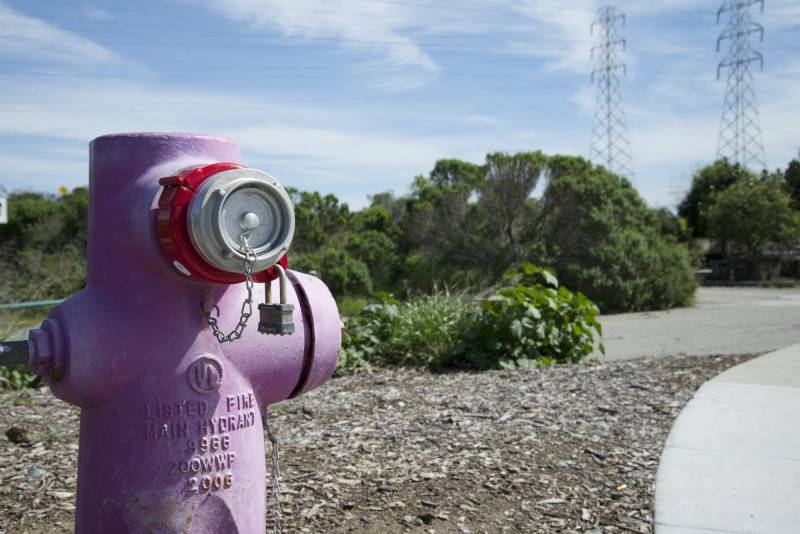 Palo Alto hopes to expand its recycled water pipeline, as does San Jose. And Bobel believes that in the future all the south county recycled water systems in Santa Clara may be connected. Ten years ago, Bobel says, expanding water recycling systems might have been impeded by lack of public acceptance. But now the public is onboard and the biggest hurdle is the cost to build the pipelines, he says. The same holds true for constructing buildings with dual plumbing to reuse graywater – it’s mostly an issue of economics, although regulatory challenges do exist, too. “The giant public sector capital investment that’s necessary to do something like this, we don’t seem to have available,” said Cain. “So we do the district approach.” In between small-scale home systems and large municipal pipeline systems is another area of opportunity – creating onsite graywater or blackwater reuse systems in buildings. A few of these decentralized systems can also be linked together in small districts. In the Bay Area, San Francisco has been a driver of this technology. Last year it became thefirst city in the country to require new developments over 250,000 square feet (23,000 square meters) to use onsite water reuse systems for any water needs that are nonpotable. The ordinance also requires buildings of 40,000 square feet or more to do an assessment of the reuse potential. The new requirement was driven by interest in a program developed by the San Francisco Public Utilities Commission, which spent several years working to align health, public works and water departments on the vision. But it hasn’t been easily transferrable to other places in California yet, although the interest is great. Marianna Grossman, a founder and managing partner at Minerva Ventures, wanted to help bring those regulations to Santa Clara and San Mateo counties. “It should be easy because it is so clear that we need to not flush drinking water down the toilet,” said Grossman. But instead she found a lot of barriers to implementation. In San Francisco, there is only one city and county. “In San Mateo, I think there are 22 separate cities and towns,” said Grossman. “In Santa Clara there are 16, plus each county has unincorporated areas that they run.” And there are also the various health, planning and public works departments. In working to help four technology companies in Mountain View to establish onsite reuse systems, she said they encountered more problems. “Mountain View’s city council thinks they’ve said they want to do water reuse, but in fact the way the regulations get enforced, it makes it very hard to do,” she said. “There is a lack of alignment in the city government from the policymakers to the different departments." Sebastien Tilmans, director of operations at the Codiga Resource Recovery Center at Stanford University, said he's also had conversations with several different technology companies in Silicon Valley that are interested in onsite water reuse systems. "They want to increase their resilience and to be good corporate citizens," he said. "But the real obstacle to getting the systems installed today is regulatory – it's building inspections, codes, things like that – and of course education of not just the public, but making sure regulators and building inspectors are on board with water reuse and trust it to be safe." Currently the State Water Resources Control Board’s Division of Drinking Water has been tasked with investigating the feasibility of developing uniform water recycling criteria for direct potable reuse, which is when water is recycled and directly piped to customers for drinking water. But these potential new regulations would not cover nonpotable water reuse projects, such as decentralized graywater systems.